Most closely related to thoughts of traveling to Paris are romance, history, architecture, art, or love. Perhaps wine, fine dining, or delectable pastry and sweets cross your mind. Paris is also well known for high fashion and shopping sprees for the ages. While these are all easy to find in Paris, the city also offers quite a few adventures for those more daring travelers. A little adrenaline rush is actually not too hard to achieve, and afterwards you can seek comfort in the chic and suave Paris hotels, followed by a rich gourmet meal. Here is a list of 15 outdoor activities, water sports, and unexpected adventures easily found in and around Paris. 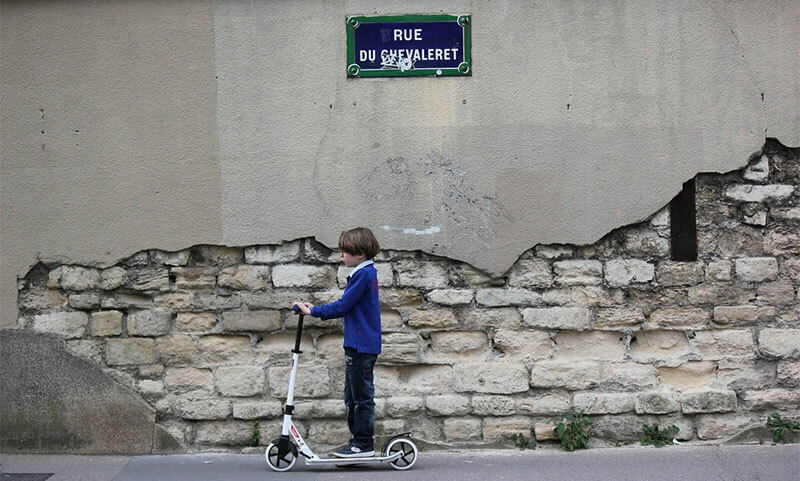 A scooter tour is a great way to get acclimated to Paris and the surrounding areas on your first morning in Paris. It is a ton of fun, and with a tour guide, it is easier to get around and they are concerned with your safety and wellbeing during the entire tour. They will show you around all over Paris and provide glimpses of the behind the scenes sights that you might never get to see on your own. It is the perfect way to get a feel of where you want to spend most of your time exploring on our own, or where you do not want to waste too much time. And, with the right guide, you might learn a lot on your tour, as many offer historical insights and bits of offbeat trivia about the sights you visit. Visit the place of the dead. Nothing compares to the underground ossuaries of Paris, where about six million people rest, to scare you near to death! Fumbling your way through dimly lit underground caverns and tunnels while the remains of those long ago passed watch over you might is certainly not for the faint of heart, but it is definitely a worthwhile adventure. Think of Dracula and the vampire’s of Anne Rice’s novels as you visit the creepy canals. The catacombs are so dark and mysterious that they have inspired incredible adventures for novelists who write about the Paris underground. Get admission information on their English website. Plenty of adventures abound on Paris’ many waterways, the Seine, Marne, and Oise rivers, as well as the plentiful canals. Aquatic centers offer facilities for sports such as waterskiing, canoeing, kayaking, wakeboarding, rowing, pedal boating, yachting, or boats for hire. Parkland provides visitors with small beaches and other non-water based activities, as well. The Marne river, located 20 km east of Paris, is quickly accessible via RER and has been the hub of rowing and kayaking in the close Paris vicinity for longer than a century. The scenery is breathtaking and it is a safe, calm waterway for leisure stand up paddleboarding, kayaking, paddle boating, and rowing. The banks are lined with early XXth Century homes, romantic tow paths, and many more lovely sights. If you just want to plan a French kayaking vacation, learn more here. Nature et Loisirs will offer you guided walks and rambles through the Montfort-l’Amaury area of the Yvelines countryside. The website lists upcoming events in English. The Val-d’Oise region has over 1,400 km of walking trails, taking the pedestrian through 2000 years of history in the Pays-de-la-France area. Plan your Friday night in Paris to include an outdoor stroll through the city on rollerblades. Yes, rollerblades. It began on an evening in 1993, and there were only 12 rollerbladers. The Friday night Rollermaniacs have grown to a few thousand, and have made their nightly apparition on the Paris boulevards an event worth experiencing. They have the support of the locals and in fact, n 1998, the French police created the world’s first rollerblading police force, to monitor and protect the wild rides. Carry your insurance card and be ready to have a rockin’ time. The Rollermaniacs meet at Raoul Dautry, 15th. Métro: Montparnasse Bienvenue. Every Friday night, 10pm-1am, but not if it rains. Visit pari-roller.com for more information and resources. Parisians do not have many large parks, but they do have two amazing woods. One is located to the west, plush Bois de Boulogne. On the east side, petit-bourgeois Bois de Vincennes boasts four great lakes, among them Lac Daumesnil. Relive childhood memories, or create new ones altogether by feeding baguettes to the ducks. Go punting round the lake in June and July. You will see what looks like a Buddhist temple – the remnants of a “temporary” temple built for the 1931 Colonial Exhibition which is still in use today. Bois de Vincennes is also a haven for joggers, bird watchers, and cyclists. A bird reserve is found at the Rond-Point Dauphine. Considered to be France’s premier botanical garden, the Jardin des Plantes was established in the 17th century during the reign of Louis XIII. What started out simply as an herb garden now includes multitudes of plant varieties from all over the globe. Travelers from all over the world have even donated seeds to the gardens to help enhance the collection. Among the diverse varieties are an American sequoia and a laricio pine from Corsica. Another notable fact is that the garden even contains the oldest surviving tree in Paris, an acacia brought back from America in the early 1600s. A lot of focus in the 17th century included planting species with therapeutic properties, and in the 18th century it was a central location for all natural and botanical medicinal research. For travelers with little ones, entertain them with a fun and safe pony ride. Little Parisians have most all ridden a pony or a donkey at least once in their lives. You can find them in all of the city’s main gardens – Luxembourg Gardens, Parc Monceau, Buttes Chaumont, and of course, the Bois de Boulogne and Bois de Vincennes. And if you don’t have your own kids with you, you will be entertained by watching a procession of donkeys and goats with toddlers riding on their backs, traveling slowly along the green lanes of the Tuileries. It is a photo worthy sight for sure. Jardin des Tuileries, 2nd, +33 1 4567 0799. Métro: Tuileries or Concorde. Open daily May to September, unless it is raining, 10:00 am – 5:30 pm. More water fun can be had by way of cruising on Canal Saint-Martin. This experience will take you back in time to the seminal 1938 Marcel Carné’s film Hôtel du Nord, which remains standing tall beside the canal. A cruise from the Bastille marina towards the Marne river will take you by the open air dance halls, famously painted by Auguste Renoir and later filmed by his son Jean Renoir. For more information about Canal Saint-Martin cruises, visit the website canauxrama.com. It is run year round Thurs., Sat., and Sun. at 9am. In July and August, cruises depart from Port De L’Arsenal. For a heart pounding adrenaline rush, try free falling without a plane or parachute. Yes, it can be done, and right in the heart of Paris at that. Indoor free falling is an experience that will provide even the highest level daredevil stomach-in-your-throat adventure. Aerokart’s free-fall wind tunnel adventure activity in Paris offers the wind in your hair thrill ride you are sure to remember. Boasting 12 outrageously powerful engines that create over 155-mph winds beneath you, this is the largest and most powerful wind tunnel in the world. The two-and-a-half-minute suspension simulates jumping out of a plane from 12,000 feet! That is the equivalent to 33 Eiffel Towers stacked on top of each other! Try jumping off of that! At a cost of about 70 euros, it comes at a fraction of the cost and a seriously lower risk of really jumping out of an airplane. Dare your traveling companion to take on this mind-blowing free-fall challenge with you. You will create memories to last a lifetime. Connect with Aerokart for more information at their website, www.aerokart.fr. Rent a cycle and join a cycling tour with writer and history teacher David Darriulat’s association of cycling tours through Paris. This group has developed thematic tours like Hidden Paris, Railway Paris, Medieval Paris, Ancien Régime Paris, and the group’s namesake, Belle-Epoque Paris. For a one of a kind experience, these tours provide easy rides, and are for the history-conscious and Paris lovers seeking hidden gems within and around the city. Place de la Nation stands tall as a proud star-shaped square east of Bastille. Designed by Baron Haussmann with grand boulevards and avenues flowing from it, this place was once called the “square of the hung throne”, because it housed the guillotine. Luckily these days are more peaceful and you can witness laid back pétanque and boule parties anytime. Anyone can join in or encourage and cheer on the players, mostly locals, and among them many retired North-Africans. While there is certainly plenty of walking and hiking to be done around Paris, those seeking to exert a little more energy and adrenaline also have at their fingertips places to get their climb on. Built under Napoleon III in 1867, who encouraged the Parisian working classes to get some fresh air, the Buttes Chaumont, in the north-east of Paris, is one of the city’s largest green spaces. It features man-made rocks, islands, lakes, a hill, and a suspended bridge. The view from the hill is simply breathtaking. Each day from 9:00 am to 10:00 am, free qigong lessons are offered, and there is a special climbing wall close to the Pirates café for the children. For a break from all the history and some of the world’s oldest architecture, slip over to Paris Plages. Another outdoor space created to entice Parisians to enjoy the outdoors, Paris Plages was created 10 years ago. Its 350 deckchairs, 50 palm trees, and 1,357 tons of Normandy sand offer free activities and fun for all. Activities offered include dawn yoga, meditation classes, readings, petanque, fencing, and free book loans. These amenities have made Paris Plages one of the city of light’s outdoor must do’s in the summer. Georges Pompidou, 3rd. Métro: Rambuteau or Hôtel de Ville, and Bassin de la Villette, 19th. Métro: Stalingrad. It is free and more information is provided at paris-plages.fr. Named for Paris’s most famous chanteuse, the latest swimming pool was built in Paris in 2006. This swimming pool floats, anchored to the Seine river in the 13th arrondissement, between the feet of both the Simone de Beauvoir bridge and the French National Library. The Josephine Baker swimming pool provides the optimal open air swimming experience for the most discriminating swimmer. This pool fits right in with the chic elite locals and travelers alike. The pool sits with a cafe, hammam, a gym, saunas, Jacuzzi, a solarium, and a children’s water pad. Located, Port de la Gare, Quai Francois Mauriac, 13th. Métro: Quai de la Gare or Bibliothèque François Mitterrand. Open Mon, Wed, Fri 7:00 am – 8:30 pm. Tues and Thurs 1:00 pm – 9:00 pm, Sat 11:00 am – 8:00 pm, Sun 10:00 am – 8:00 pm. There is a small fee.